This morning after Mass, I knew that I had to stop and pick something up, and I found myself walking aimlessly around in Walgreens (drugstore) wondering what the heck I had come for. Then I remembered--lettuce. "Oh," I thought to myself, "I guess I should have stopped at Kroger (grocery store) instead." So I put my cart away and went back to my car feeling like an idiot, but at least it gave me the opportunity to take a picture of this. 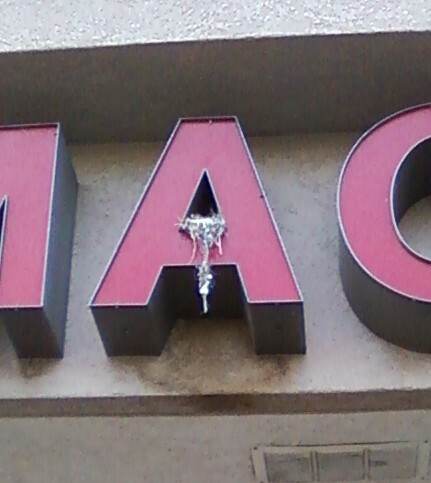 I love seeing bird nests stuck away in urban places like this. Apparently this bird mother was hoping that she could influence her babies to get good grades. And seeing the nest above my head, reminded me that I wanted to write something about this morning's first reading at Mass. I'm sure you are familiar with the story. 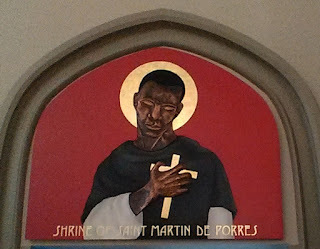 Tobit, having fallen asleep under a wall where birds are perching, has been blinded by their droppings, and he continues the story in chapter 2, verses 11-14. At that time my wife Anna worked for hire at weaving cloth, the kind of work women do. When she sent back the goods to their owners, they would pay her. Late in winter she finished the cloth and sent it back to the owners. They paid her the full salary, and also gave her a young goat for the table. On entering my house the goat began to bleat. I called to my wife and said: "Where did this goat come from? Perhaps it was stolen! Give it back to its owners; we have no right to eat stolen food!" But she said to me, "It was given to me as a bonus over and above my wages." Yet I would not believe her, and told her to give it back to its owners. I became very angry with her over this. So she retorted: "Where are your charitable deeds now? Where are your virtuous acts? See! Your true character is finally showing itself!" The first time I heard this read at Mass, I almost laughed out loud. Sometimes conversation in the Bible sounds archaic or it reflects a culture that is different than our own, but this conversation between the husband and wife sounds so natural, and it calls our attention to something that we all have to face up to in our own lives from time to time. It's so easy to be charitable in public, but so hard to be charitable at home, or in other places where we are comfortable and let our guard down. Whoever said that charity begins at home was a real idealist. Every time I say in the Act of Contrition that I am going to avoid the near occasion of sin, I wonder how I think I'm going to do that. My usual occasions of sin are the people I live with, the people I work with, and the people I go to church with--hard to avoid. I'm always thinking that the only thing I can do is to think up ways that I can avoid these temptations by being prepared ahead of time. I don't think I'm very good at that yet. The best way, I think, is to remember that, as Caryll Houselander reminds us, Christ is there within all these people. Trying to always remember this is probably going to be the work of a lifetime. Oh Louise! The only non-spam comment I've gotten in two days and I deleted it by accident! Sorry.